When I started using Letraset Markers I also read about Letraset Aqua Markers. I was confused at first, but discovered that Promarkers were an alcohol marker, while the Aqua Markers were essentially watercolor. I’ve never been that happy with other water-soluble mediums, so I decided to pass, and just concentrate on the alcohol version, which I love. 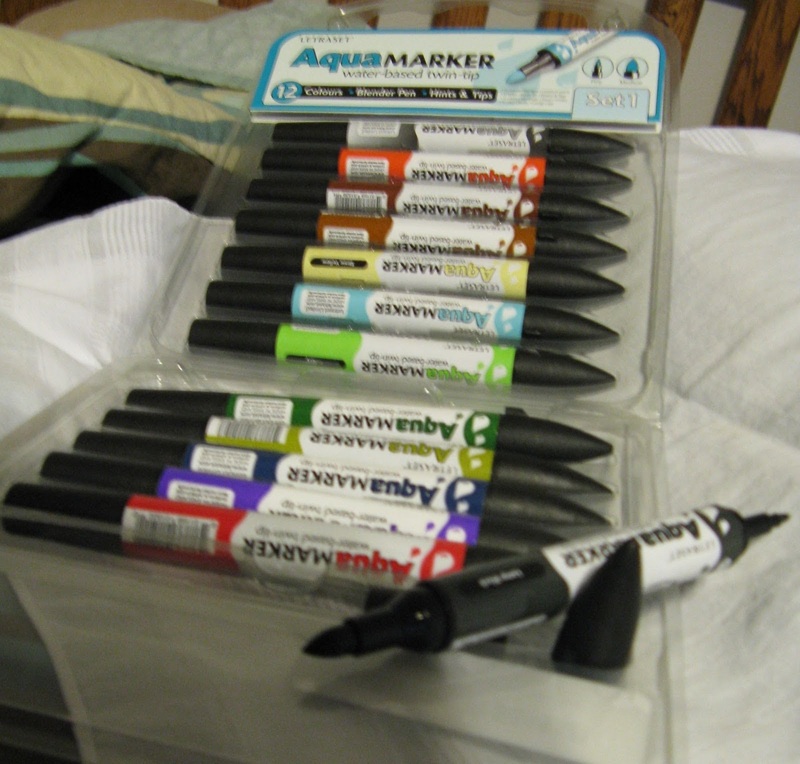 Then last week, I ordered a Promarker Blending Set II, but Aqua Markers were delivered instead. Well, I’m a big believer in the universe and its desire to send messages, so I decided to give the Aqua Markers a try. Problems that I’ve encountered with other water-soluble markers, pens and colored pencils were weak color, hard lines that couldn’t be eliminated, and the inability to spread the color into a wash–the very hallmark of watercolor. So I decided to see how the Aqua Markers handled these things. I had just picked up a copy of Linda Kemp’s Watercolor Painting Outside the Lines, and I decided to try using the Aqua Markers for one of the exercises in the book. Well, you still can’t get the same wash you can with a professional grade watercolor, but they are quite good washes, easily worked up and the color spreads nicely, becoming lighter but still retaining color. You have a good deal of control. 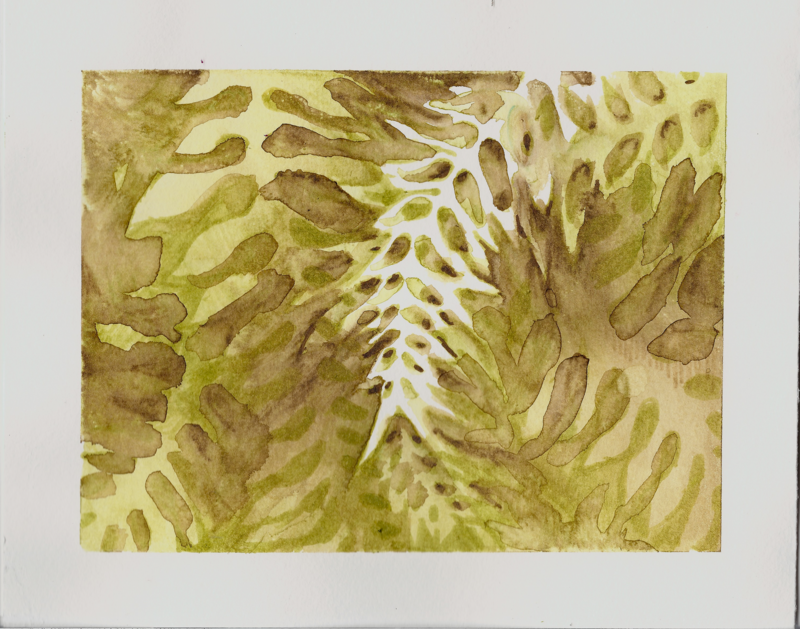 I’d say the experience is similar to a wet-on-dry watercolor wash.
My problems with other watercolor media were, at least in part, due to my inexperience. With effort, I might have been able to get the effects I was trying for. But with the Aqua Marker, I found it easy to jump in and I got the effect I was shooting for with the first attempt. The markers have two tips, one thick for large spreads of color and one thin for finer detail. The thick is about the six of a No. 6 round brush, I think, and the thin about the size of a No. 2. They give enough control to use for coloring stamped images, but enough freedom for watercolor painting. I’m quite pleased with this message the universe sent me! Great review. I've recently had some folks asking about these and you're the first person I've run into with any experience. Thanks for sharing!